Evan, an employee-owner since 2016, breaks down the process of designing a rack system for long, heavy or unwieldy loads like pipe, tubing and lumber. You can find his helpful articles on this blog, and sometimes run into him at our various trade shows. 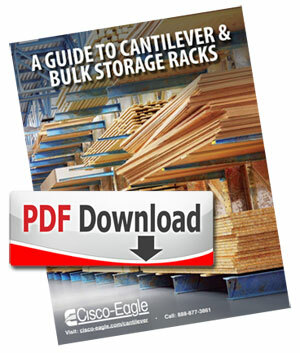 You can also download our guide to cantilever racks, which offers a comprehensive dive into various rack types, applications, storage loads and much more. This PDF download also has rack type listings and a detailed specification guide you can print and take with you. We are driven to help you identify, specify, and implement the right products and systems for your operation. Every full-time employee owns shares in the company, is provided detailed financial information and is trained to provide exceptional service. We think owners provide better service, and we can back it up. This year, we’ve started showcasing our employee-owners in Shop Talk, a series of informational posts, videos and other information. We are empowered to get things done for you, and Shoptalk is just one more way we prove it every day.